The Honorable Sharon Burke participated in the Sasakawa USA 2017-2018 In-Depth Alumni Research Trip to Japan. 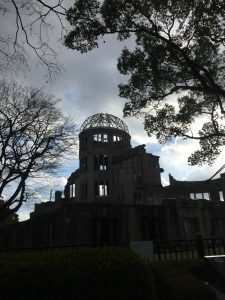 Burke submitted the paper “Strategic Distraction: America, China, and Japan in the 21st Century Competitive Space,” based on her research and findings from the trip. Burke posits that Japan–playing to its strengths as a security builder–has an opportunity to improve global readiness for the great security challenges of the later part of this century, not all of which are military in nature. Burke participated in an October 25, 2018 lunch discussion at Sasakawa USA to share her findings. A defining question of the 21st century is whether a third world war between China and the United States is inevitable, or whether these would-be adversaries can find a way to coexist. At this time, the two countries seem to be on a path that leads to kinetic conflict, even as new technologies are changing the very character of war and the global security landscape is shifting. The United States is approaching this new era with a credo of “great power competition,” giving pride of place to military lethality. Even as the current U.S. Secretary of Defense points to the importance of “the competitive space” in global affairs and the primacy of non-military power and global partnerships, the United States is concentrating its investments in legacy weapons and confrontational diplomacy. This is a time of strategic distraction for America, embroiled in political divisions at home and regional battles abroad. China, meanwhile, has been seeking to define the “competitive space” for some time. From information age minerals in Africa to Hollywood’s global cultural power, the Chinese are making strategic investments all over the world. A signature effort, the Belt and Road Initiative, allegedly means trillions of dollars in “win-win” infrastructure improvements for 65 countries, from the Port of Gwadar in Pakistan to the Panama Canal. At the same time, China is pouring money into its military and making increasingly aggressive moves in the South China Sea and elsewhere. In this inauspicious moment for great power comity, there may be an opportunity for other countries to play a constructive and catalytic role. Japan, in particular, has a part to play. The United States has long pushed Japan to bring more conventional military capability to the bilateral alliance, but the alliance may benefit even more from Japan’s strengths in diplomacy, development, trade, and cultural presence. More to the point, global public opinion polling suggests Japan enjoys a position of trust that China and the United States do not at this time. In playing to its strengths as a security builder, Japan also has an opportunity to improve global readiness for the great security challenges of the later part of this century, such as climate change,which are not all military in nature. The Honorable Sharon Burke is Senior Advisor and Program Director at New America, a national research and civic organization headquartered in Washington, DC. At New America, Burke initiated and leads the Phase Zero Project, which researches conflict prevention and strategic advantage. She conducted research for this article through the support of Sasakawa USA’s In-Depth Alumni Research Trip. This paper includes conclusions from interviews held during the trip. Out of respect for the confidential nature of the interviews, the names and/or affiliations of sources are not necessarily identified in this paper. Prior to her position at New America, Burke served in the Obama Administration as the Assistant Secretary of Defense for Operational Energy, an office with a statutory mandate to improve military energy security. In that role, Burke devised strategies and policies to improve energy security in the defense budget, the defense acquisition system, the requirements process, and in research, development, test, and evaluation, as well as rapid fielding of new equipment to deployed forces. Burke’s government career started in the U.S. Office of Technology Assessment and has extended to senior positions in a number of federal agencies, including Country Director for South Asia in the Pentagon and the Speechwriter to Deputy Secretary of State Richard Armitage. Burke has numerous publications and awards and consults with a number of private organizations as an advisor or board member. She was educated at Williams College and Columbia University, where she was an International Fellow and a Zuckerman Fellow and received a Certificate of Middle Eastern Studies, in addition to a Master’s Degree.